Above is Art Cumings, know for the long-running "Balloonheads" feature in Penthouse magazine. He's also done childrens books. New Yorker cartoonist and one of the minds behind the Puzzability company Robert Leighton. Check out their New Yorker cartoon puzzle book. Bill Gallo autographing a Daily News cartoon for hostess Bunny Hoest. Mad Magazine's Tom Richmond and Mike Lynch, who are smiling a little too enthusiastically. Tom flew in from Minnesota that morning just to be at the bash. NY Metro cartoonist Tony Murphy gives King Features' Karen Moy a gift. I liked the way Karen was so seriously trying to figure out what it is that Tony brought her -- and then that big smile when she sees it's an original strip! Cool! Mad's Ray Alma, NYC NCS Treasurer and toy designer Andy Eng, Mike Lynch. Rain and thundershowers were predicted all week, and you can see one of the big tents Bunny had erected. The rain held off, not arriving until around 7pm, well after the Bash had broken up. Australian cartoonist Jason Chatfield and Jason's girlfriend Kate stand in awe of Tom Richmond. I think Tom, who was hoping for that "Travelled Farthest" plaque, is trying to put a good face on that fact that he's in second place thanks to Jason. Jason C. has a travel blog here. Jason also said when we met, "Oh I know your work." He had seen some photos of me at my pal's Mark Anderson's blog. "Yes, Australians read the Andertoons blog," he told me. Soup to Nutz cartoonist and NCS President Rick Stromoski laughs. Ray Billingsley sketching and talking. A lot of kids were coming up to him and he was drawing Curtis for at least 20 minutes straight. Have a wonderful Canada Day and/or Independence Day. Back next week for more fun. Until then, here is illustrator Johnny Gruelle's salute to the 4th of July. Gruelle was born in 1880 in Arcola, Illinois. A prolific illustrator, he's best remembered now as the creator of Raggedy Ann. Classic comic fans may know that he created the comic strip Mr. Twee Deedle for the New York Herald; a fantasy strip that echoed the then-departing Little Nemo. Now, be careful with them firecrackers! I spent the early part of this week drawing and redrawing. Last week I wrote a lot of cartoons. Well, actually, I sketch them in a notebook. Years ago, I started the sketchbook process. I spent C$13 on this pad. (I bought it at the Charlottetown, Prince Edward Island, while on vacation.) It was the first pad. On each page, I divide it into a dozen squares and, being a thrifty sort, I draw on both sides of the paper. That's why the paper is a honking 110 lb. ; a very thick page. It's almost, but not quite, poster board quality. So -- 50 spiral-bound pages, 2 dozen images a page -- well, that's a large quantity of cartoons I can put in the drawing pad. (After yesterday's bad math blog entry, I'm wary of anything, even simple multiplication.) I hand draw the squares. You can see how wobbly they are. I used to draw on pieces of paper and, being a poor housekeeper, the papers would scatter and I would lose them in my tiny apt. Making an investment in one bound book of blank paper was, at the time, a big decision. I knew from previous experience that even a bad idea could be looked at a little later and, after a bit of tinkering, make it into a better idea. But not being able to lay my hands on old sketches was driving me crazy. For me, I produce a lot of, for lack of a better word, garbage: bad ideas, stillborn cartoons, cliched captions, bizarre nonsensical situations. Producing the stuff that doesn't work is part of the process. It was daunting to draw what I knew was not that good stuff on this nice paper. But I forged ahead. And, for me, it's been very helpful. Sometimes I'll look at a cartoon that I drew last month, and see that it's funny. Or I'll see some tortured, long-winded line from months ago and figure out a quick way to cut it to a precise, funny line. I don't know why it works like this. My process is not the be all and end all. It's what works for me. One cartoonist I know just writes the captions on a piece of paper. For me, I need the image and the words together. Eldon Dedini said in a Cartoonist PROfiles interview, "To be truthful, it's still a mystery to me. And it's the mystery that makes it interesting .... Maybe if I knew more about it, I'd lose the touch." Yes, well, it's rather mean, but shopping is all part of a woman's world. I guess that's why Woman's World purchased the above scratchy, snarky cartoon. I really don't like a mean cartoon, unless it's clever -- and I thought there were maybe 9 other cartoons in my batch of 10 that were better than this, the editors thought different. I think you should do what you think is funny, and concentrate on that. I've been drawing cartoons for years now and still have no idea what cartoons will sell and what won't sell, so I never feel right criticizing anyone. I think the most important thing is to be able to produce 10-15 finished professional cartoons a week, every week. For instance, out of all the cartoons I drew during the week of October 22, 2002, only the one below sold. All of the others, despite being sent to a lot of markets, failed to sell. Some weeks are like that. I always heard that if you sell one or two cartoons out of a batch of 10, then that's considered a success for a magazine cartoonist. I don't remember where I heard that, but it works out that way. In a good month, maybe three cartoons. Not always the cartoons I want to sell are the ones that do sell. 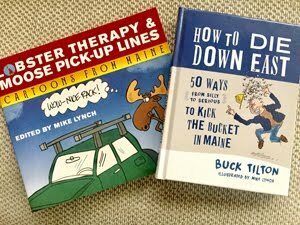 The wife of my pal magazine cartoonist Mark Anderson blogs about her life with him at Mark's blog. It's titled, "Smart Woman, Foolish Cartoonist." No. Not really. She's a wonderful, supportive spouse who enjoys the long discussions about what is funny. And she lets him to buy cool cartoon stuff too! I was fortunate enough to visit the Anderson compound for the first time this past May. When I offered to help cook dinner, I was soundly rebuffed by Mrs. Anderson and received the suggestion that I maintain my stationary position and enjoy my beer. Whatta woman! She spoiled me! Mark and I have similar histories: We worked "normal jobs" for a while before surprising our spouses with our cartoon freelance life. A move that would, obviously, be impossible without their strong belief in our cartooning abilities. 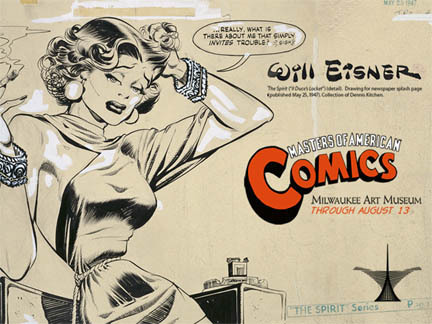 I always thought it would be interesting to have a panel of cartoonists' spouses for a convention. I wonder how many are deeply involved in the process? I would want to go to a panel like that. The nice thing about seeing a cartoon of mine in the Funny Times is that so many of my cartoonist friends are in it as well: Tony Murphy, Steph Piro, Clay Bennett, Dan Piraro, Carla Ventresca and Mark Anderson and others. And FT is headquartered in Cleveland Heights, OH, just a couple of miles from where I went to high school. Digression: I managed an outdoor theatre in the local Cain Park. It was a summer job, the year after I graduated high school. My friend Rob Towns helped me get the job, which entailed working during the day to put together sets for the shows, and then working half the night, running the shows. Long days! We were paid $100 a week. And I still remember Rob muttering at least once a week that the longer we worked that day, the less per hour we made. But it didn't bother me. I liked what we were doing, and, frankly, I was too busy to spend much of that money. However, one morning I was riding my bike a couple of miles from my house to Cain Park, and I was sleepily weaving through Cleveland Heights -- when all of a sudden I fell asleep while riding my bike and I landed on a guy's lawn. Plunk! Nothing was damaged except my pride. Alternate caption: "You're moving back in with us? But we were going to move in with you." I remember drawing this with charcoal, conte crayon and wash a couple of years ago. This was, obviously, back in my charcoal, conte crayon and wash phase. I liked the look of the cartoons, but they took more time to produce than I wanted. The street is my street in Brooklyn. I liked trying to draw the guys in the cartoon as similarly as I could, since they are father and son. I'm not sure how successful I was in drawing it and I think maybe the alternate caption is a better one, since it explains the relationship better. The cartoon was drawn in 2002 and actually published twice. But first, let's take a look at the rejections! And a couple more magazines in the UK. So, even though it was published, I sent it to any other market I could think of. So, there we have it: a cartoon that double-dipped. This happens a number of times a year and that second time it sells is just so much gravy. It's kinda crazy being a freelancer, huh? Most of my friends are. It's an interesting life, you can work as hard as you can push yourself. Just don't wind up falling asleep while in motion! I'd be interested to know more about why the NYer editor then was deciding he wanted cartoonists who could write their own material. In other words, why didn't that happen ten years earlier -- or later? 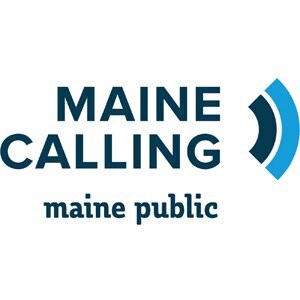 Voice from bank - Hey, mister, your oars are driftin' away! Contented lover - That's all right. We don't need 'em any more. These cartoons are from Judge magazine, a leading humor mag, created by Puck magazine contributors who jumped ship to create a rival humor magazine. Gamin - Carry your bag for a nickel, mister. Pater - No, never mind, boy. Gamin - Carry the kind fer a quarter. Now I would be remiss if I didn't let you know that the fellow who had his white corpuscles drained out of his body by a cloud-like space vampire (above) also has his own Web site! His name is Eddie Paskey and if you're a true Star Trek TOS fan then you know that he was Shatner's stand-in. Eddie has a site, with some terrific behind the scenes photos. Eddie was actually in dozens of TOS episodes. It's hard to get a good red shirt down! There's a lovely personal remembrance from Donald Reilly's friend and cartoon editor Lee Lorenz here. It's a five minute recording of Mr. Lorenz talking, along with a slide show of photos and cartoons. Wish it was longer! Donald Reilly, a stalwart cartoonist known for his New Yorker contributions, passed away at the age of 72 this past Sunday. Comics Reporter has good links. I'm fortunate enough to get up the NYer mag offices and even more fortunate to get invited to the cartoonists' lunch afterwards. I did not know Don Reilly that well. I mean, we knew each other well enough to say hi and he knew I was some other (upstart) cartoonist vying for a space in The Magazine. I admire Reilly's work. It has a lot of breadth and is very pointed. And, according to the NY Times, Reilly did the writing himself. 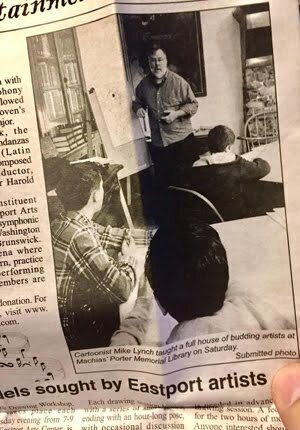 "Most artists sketch things out, make preliminary drawings," Mr. Lorenz said in a telephone interview yesterday. "Don liked his work to be as spontaneous as possible, and he was one of the few artists who would sit down and just do a drawing." That is so cool. No pencil sketch. So free. So scary! Oh my. This is so incorrect. It's good ol' Mr. Wilson having a happy moment over a hookah. 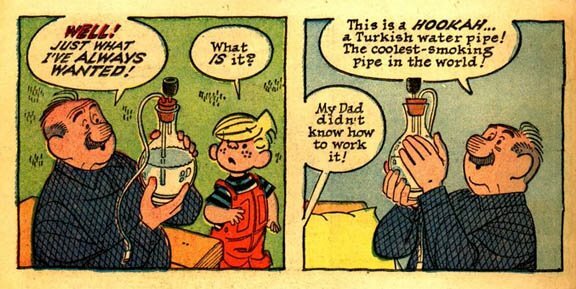 This is for real, from a 1960s Dennis the Menace comic book, for goodness sake. Maybe Wertham was right! This is from the arglebargle blog, by C. Martin Croker. And there's another weird Dennis tale here. Cartoon Brew links to some scans from The Know-How of Cartooning by Ken Hultgren. It's from C. Martin Croker's terrific blog. The Milwaukee Museum of Art hosts the Masters of American Comics exhibition through August 13th.It moves to New York City, to The Jewish Museum beginning September 15th. This is all fine and good and I look forward to seeing the show. For now, you can view these wallpapers. There's the Spirit one above, and the Peanuts one below, as well as a Jack Kirby and a Crumb. And the cool thing is that you can see the Pro-White or Wite-Out on the art. I don't know why, but I find it interesting to see these pieces of art with their blemishes. I guess because it's a peek into the process of the artist. 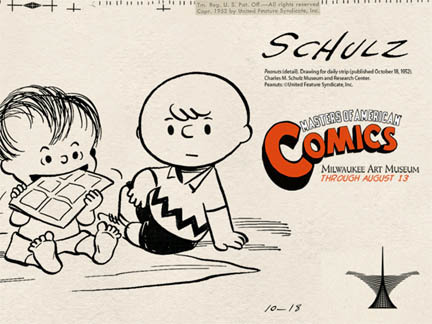 Keeping with tradition, Schulz work is without any Wite-Out. I was told by the person employed by the United Media syndicate whose job it was to open up Schulz original strips, that Schulz did not have any Wite-Out on his strips. This person's job was to check the strips for grammar and spelling. There were, I was told in a serious tone, no grammar or spelling mistakes. I think this story is retold in a Schulz book. Anyway, I heard it from the source, and tend to believe it. That's one heckuva persistence of vision. Here we go, talking about Star Trek TOS (The Old Show). Now ... what can you do about a show that's been seen over and over and is really old news, etc? Well, you can enhance it a bit. Blow off the space dust and give it a bit of nip and tuck. "The Doomsday Machine" episode was about a massive, deadly ship, that looks like one of those cornucopias that you see around Thanksgiving time. Anyway, in Star Trek it was wandering the galaxy, destroying planets and ships. Over 20 years later, in the early 1990s, Paramount contacted a company named Digital Streams to enhance all of the visual effects in the episode. YouTube has the "rough proof-of-concept" footage and it looks quite good, especially for early '90s rough test footage. And there is even a bit of a Sandwormy redesign on the cornucopia planet-killing machine. I wonder if this was an idea to distribute some of the episodes as "special efx editions." Anyway, for whatever reason, the project was dropped. What's interesting is that in both of the revised efx episodes, the destroyed starship still hangs "down" in space, listing a little to port. The 1990s version of the Enterprise has more baffling and details on the hull, but Dochterman, in his 2003 version, stayed with the clean hull design from TOS. He also chose to stay within the original design of the planet killer ship. Digital Stream did the most work, showing efx throught the entire episode. Dochterman gives us only the teaser, titles and first act. But I liked Dochterman's best, since he stayed within the design of the show. Above is a news story and (at about 2 minutes in) clips of the "Spock's Brain" show being done live. Similar to the Brady Bunch episodes that was being done as a comedy show in NYC -- this is the first time that Paramount has officially licensed Star Trek to be performed in this manner. This improv group is just doing an episode of the show verbatim, and it looks to be pretty funny. The audience members, as well as cast, seem to have a genuine fondness for Trek and how silly it could be. Instead of being able to go out and do things, I have to have things come to me. I hate being sick! I did some errands today and they were totally exhausting. So, it's time to peek at Some Great Cartoony sites. Right there is a cover by Joe Sinnott and Vince Colletta (I think it's Vince Coletta) for Charlton Comics' Gorgo. Lots more at Joe's site. He changes what the monthly feature is every month and this is Junes/ Joe is also looking for a couple dozen comics that he would like to have that has his art in them. His site is JoeSinnott.com. What else? 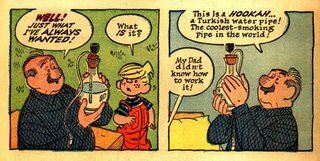 For your edification, here is a naughty Beetle Bailey cartoon from 1955. Obviously, it was not in the local paper. The cartoon originally appeared in Ever Since Adam and Eve, edited by Mel Casson and Alfred Andriola, McGraw Hill Publishing, 1955. Bob Staake shows us the cover illustration from his new book Pop Bead People. The cool thing is that Pop Bead People is both a 2D bbook and then there are 3D little toy versions of the characters. Bob makes all his creations -- no matter how many "D"s -- fun and colorful. I've met Bob just twice, and each time I see him I tell him this and I think I embarrass him. But, hey, I love his work! I was walking past the Coles Bookstore on 42nd Street and saw this in the window. 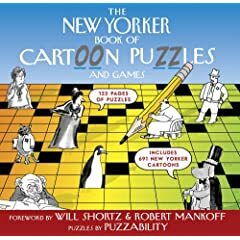 My friend Robert Leighton, along with the whole team at the Puzzability company that he co-founded, have teamed together with The New Yorker Magazine to produce The New Yorker Book of Cartoon Puzzles and Games. Robert is a cartoonist whose work has appeared in The New Yorker, Wall Street Journal, Nickelodeon Magazine, and other publications. He also creates mind-bending puzzles. I'm in awe of that! There's a lot to like here: Previews of a great goofy comic titled BIG APE GO MENTAL!, some of his Dark Horse Comics work, and tons of material on Grimmwood, a new animated feature. You'll get sucked in. Hey, there's a new movie called Ratatouille. It's gonna be by Brad Bird -- the fellow who directed The Incredibles -- and it'll be out next year. And the cool thing is that there's a funny trailer on the Web. But this is all so new that when you Google Ratatouille the above image is what you get. In a couple weeks it'll be the below image, you bet. Hat tip to the always excellent Cartoon Brew site. The MoCCA Fest is traditionally held in the Puck building. Bohemian sculptor Carl Buberl is the guy who did the statues of Puck on the Puck Building. He was Bohemian by way of actually coming from Bohemia, like my great grandfather. Of the 2 statues, one appears to be looking at himself, and the other is aiming his mirror toward the sidewalk. The Puck Building was best known as the home of Puck magazine. Joseph Keppler, a star illustrator at Frank Leslie's Illustrated News, started the magazine in 1876. It was in German the first year. The following year the magazine went to both German and English editions. Color cartoons figured on the front page and the centerfold. Specializing in political and social cartoons, the weekly 10 cent,16 page paper was selling a constant 80,000 copies a week. I post this since I have got a cold this weekend and had nothing to add about MoCCA Fest. This is the first time I've missed it, darn it!